The GDPR deadline is May 2018. Alarmingly, Forrester reports that half of organizations across the EU and the US are unaware of the new European General Data Protection Regulations. Failure to fully comply by the deadline will result in fines of up to 4% of global revenues. It’s not too late to get on track! 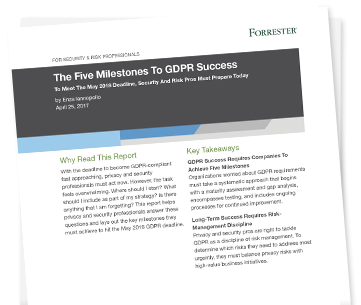 Get this report today and fast-track your GDPR compliance strategy.